Our sun is truly a magnificent object. Without it, life would not exist on this blue planet. Just because the sun is too hot or bright for us to handle for too long does not mean you can’t learn more about it with fun scientific experiments. 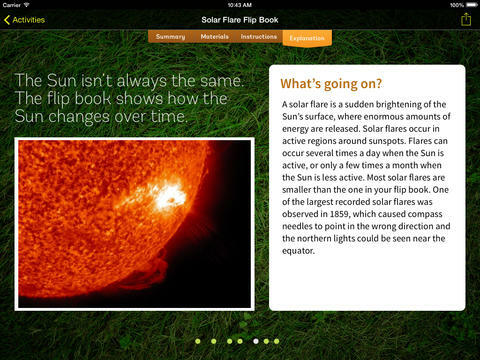 DIY Sun Science for iPad happens to be an awesome app that shows you how you can learn more about the sun anywhere you go. 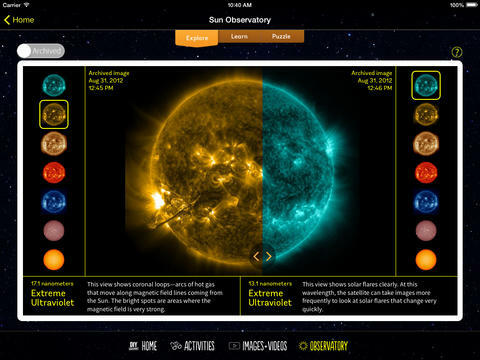 The DIY Sun Science, which is funded by NASA, has fun ideas for families and educators to teach students about the sun. It includes videos and other fun content to help. For each activity, you are provided with step by step instructions and explanations. Material lists are provided to make your life easier. DIY Sun Science does not have super crazy experiments that only geniuses can do. It is family friendly and most of its materials you can find easily. It also shows you age level and activity length, so you can better plan for your experiment. A pretty decent educational app if you ask us.